I just looooove mail! The best mail comes from readers and like-minded letter writers. A couple of weeks ago, I opened up p.o. box 1219 and not one, but two letters were waiting for me. Yay! Both ladies made promises to write more letters in 2013, so I decided to send them each a letter and some supplies to help them make good on their goal. Thanks so much for your letter! It was the first since the big comeback–my post box was singing with glee! I love that you are participating in lettermo.com. I had never heard of it, but love the premise (obviously). Letters are so different than emails, “lasting and ephemeral” indeed! Thanks for sharing and thanks for sending letters! To help with your letter-writing journey and as a thank you for reading, I’ve enclosed a few pieces of stationery and an official Letters from Lauren pencil! May this month be the beginning of a lifetime of paper correspondence. P.S. Love that you love Greer! The best–as was your paper choice! Thank you so much for your note and its kind sentiments. I love writing letters and ‘meeting’ kindred spirits through the post is the best! 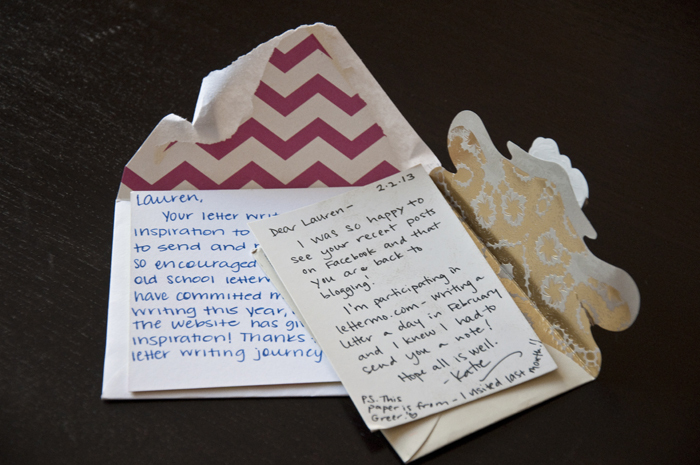 I am so delighted and honored my letter writing journey has inspired you to put pen to paper. It’s a great way to connect with people in a way that feels extra special. And as far as I’m concerned, an excellent excuse to purchase fancy paper and pens with reckless abandon. 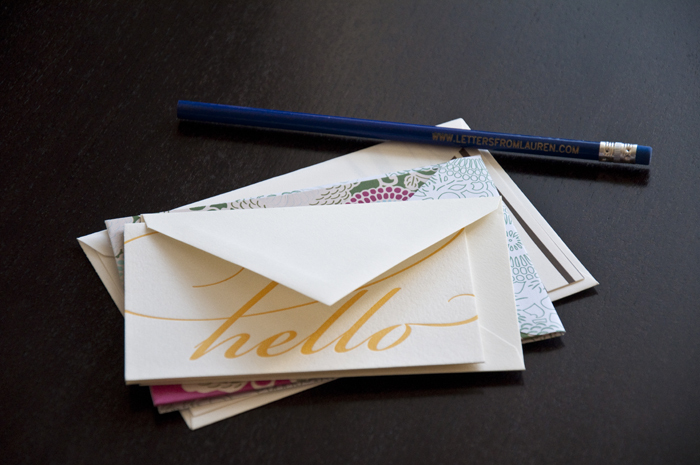 I’m enclosing some stationery to help you reach that goal of sending more letters in 2013. 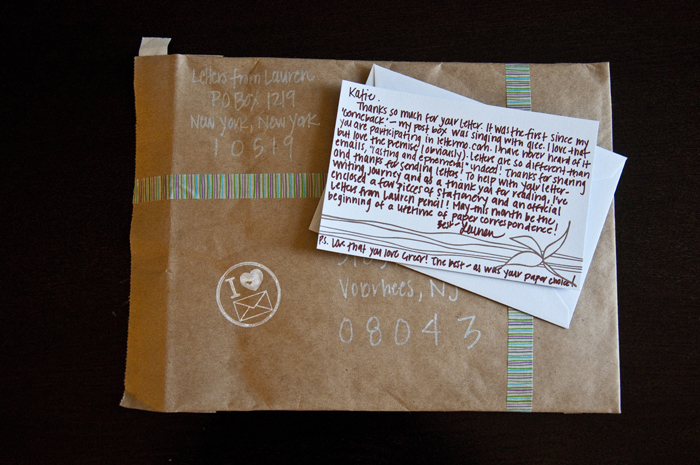 Oh, and an official Letters from Lauren pencil (you’ll be the envy of all your friends, wink). Thanks for reading! I received your note and package a few days ago and I was thoroughly delighted! Thank you so much! Since we have a shared love for Greer, I thought I’d share the video I made for my YouTube channel. In this video, I do a “Chicago Haul” – showcasing all the things I purchased on a recent trip to Chicago. In the first part of the video I show-off my Greer purchases. Hope all is well – I’ve really enjoyed seeing all of your new posts!